In about 1859 French explorers Groseilliers and Radisson built themselves a small log house near the Ojibwe village of Agamiwikedosubiwishen, which was protected from Lake Superior’s rough weather by a bay the Ojibwe called Shagawaumikong, the “place of shallow water.” The inlet’s name would later evolve to Chequamegon Bay, and Ashland would grow along its shores. The French explorers soon left for Montreal and would never return, having lost their license to trade in the area (which motivated them to switch loyalties from France to Britain, prompting the English to open the Hudson’s Bay Company). Instead, in 1865 French Jesuit Claude Jean Allouez came to Chequamegon Bay and built a chapel of tree bark. Nearby Ojibwe as well as Kickapoo, Fox, and Sauk came to see the French priest’s odd chapel, and within ten years of his arrival Chequamegon Bay had become a major trading center. In 1854 Asaph Whittlesey and George Kilbourne reportedly cleared a small stand of ash trees at the end of the bay and named the clearing, of course, Whittlesey. Six years later the fledgling township was rechristened Ashland. But the financial panic of 1857 and the Civil War stopped the town from growing, and even Whittlesey moved away; at one time just one family lived in the town. Rumors of an impending railway to Chequamegon Bay in 1871 got things moving again, and soon Whittlesey and other early settlers returned. Discovery of iron ore on the nearby Gogebic Range also fueled the population boom, and soon the town thrived, boasting over two hundred buildings. When the Wisconsin Central Railway reached the bay in 1877, Whittlesey drove the final spike. Soon Ashland was shipping out iron ore, including every ton pulled from the Gogebic Range. 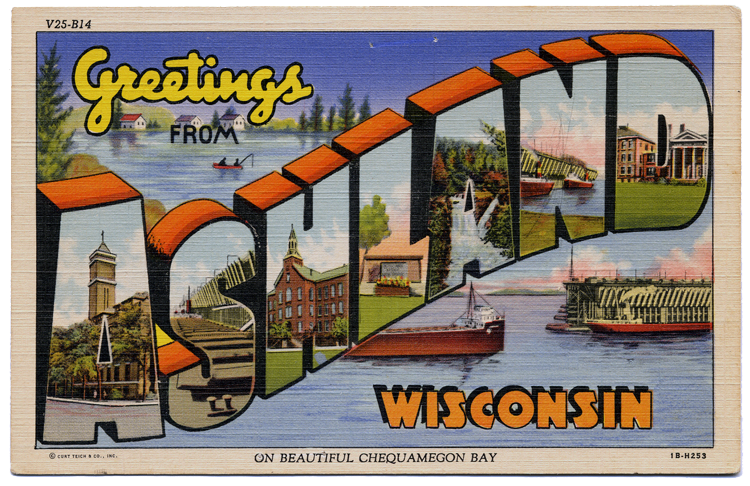 Like other towns along the Wisconsin south shore, Ashland benefitted from sandstone quarrying and some fishing. It also became the home to many coal docks and once ranked as the seventh largest coal dispersion center in the country. But for a short time lumber was king. At one point nine mills operated out of Ashland. It has been said that on a calm day, the sawdust from mills in Bayfield, Washburn, and Ashland covered the entire bay. Ashland’s early industries suffered the same fate as those in other towns along the South Shore.